Today is a focus on foliage, as it is Garden Bloggers Foliage Day (GBFD), hosted by Christina at Garden of the Hesperides. Lychnis coronaria (Rose Campion) and Stachys byzantina (Lamb’s Ear) look fresh in the border along the southern side path. 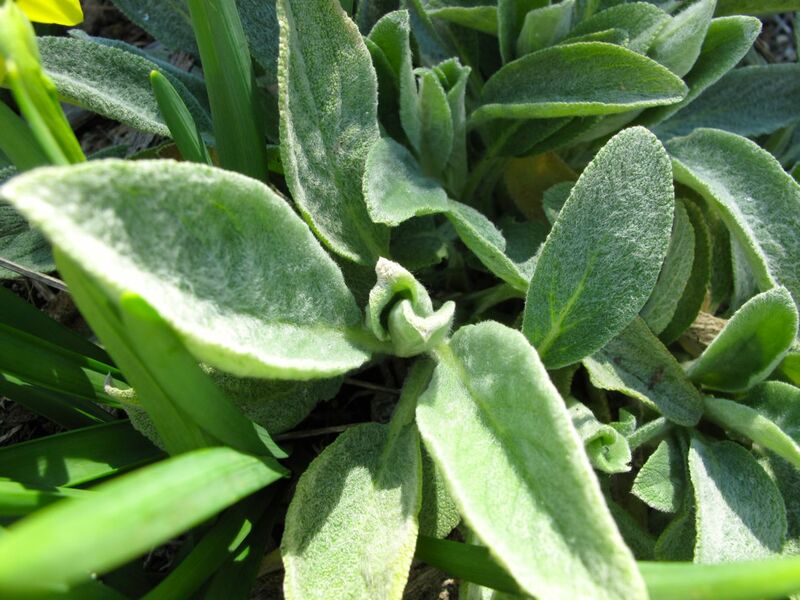 They will add some early spring blooms in a few weeks and silvery foliage all summer. I have what I hope is a little wildflower I cannot identify and wondered if any of you recognize this plant? It defies the camera every time I try to photograph it but perhaps it is recognizable. I have planted several things in this location, but they do not match up to the structure of the plant. Of the many Dianthus barbatus (Sweet William) I planted last year only one or two made it. In fact, many types of plants I purchased mail-order last year arrived too late to get a good start before the summer heat set in. This year I bought Sweet William seeds to sow directly into the soil. Another mail order selection from last year, these couple of Anemone coronaria ‘Governor’ (Governor Double Poppy Anemone) are the only survivors. I planted them as bulbs after a good soaking, but again I think the weather became too hot before they established. This native ground cover has been slow to take hold in my garden, but it seems to be improving and is just about to bloom. 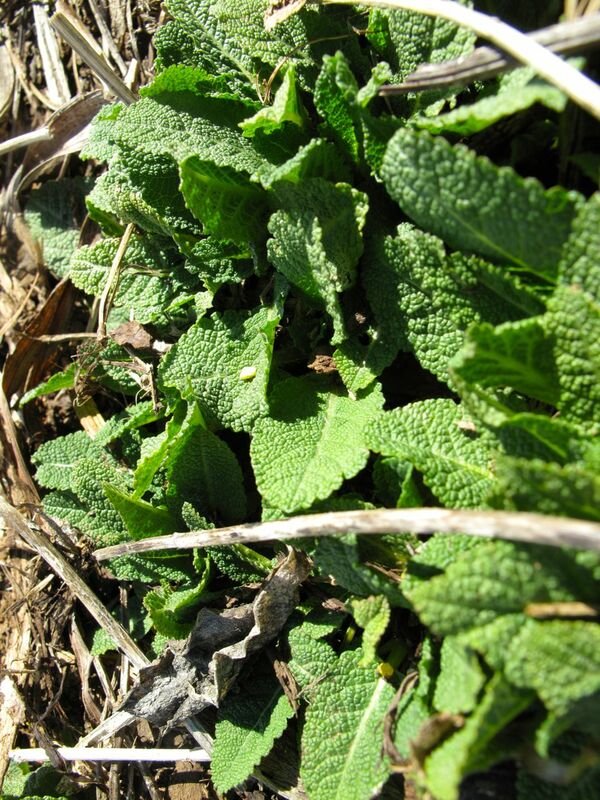 It is called Chrysogonum virginianum (Green and Gold). 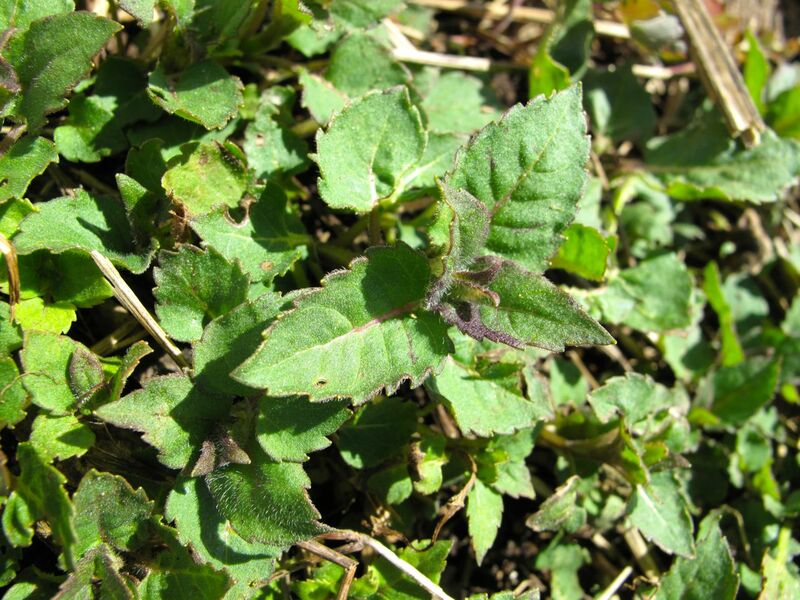 Two other natives, Monarda didyma (Scarlet Beebalm) and Aquilegia canadensis (Eastern red columbine), display healthy fresh green growth. 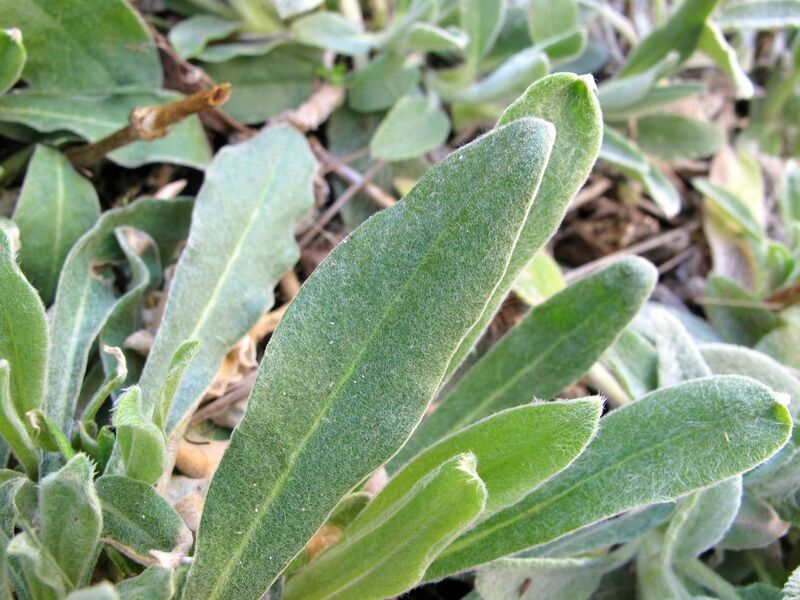 I have not divided Meadow Sage ‘May Night’ before but think I will give it a try today. It seems to be short-lived in my garden. Does anyone have that experience? I purchased two peonies last year, but see signs of neither so far. I think this is actually one scored from the neighborhood plant exchange last year. The winter has been longer and deeper than in recent years. A 2012 grouping of five Gardenia jasminoides ‘August Beauty’ gives a hint. Two of the five shrubs are completely brown, although the woody stems still seem to be alive. I have not been impressed with this particular variety of gardenia, but I see they definitely are situated with too much winter exposure. I plan to prune them back, maybe relocate them, and they should recover. If I ever go through all my saved tags perhaps I could verify these as Juniperus chinensis ‘Spartan’ (Spartan juniper). They lived in pots for several years along the front walk and showed a lot of promise when I first planted them out into the garden, but after the winter snows and ice they have me discouraged. One of my long-term goals is to fill in the hedges to provide screening but I am not progressing much in this direction. I am heading out into the garden now. Have a great weekend. Visit Christina at Garden of the Hesperides to see what foliage she is highlighting this month and find links to other participants. 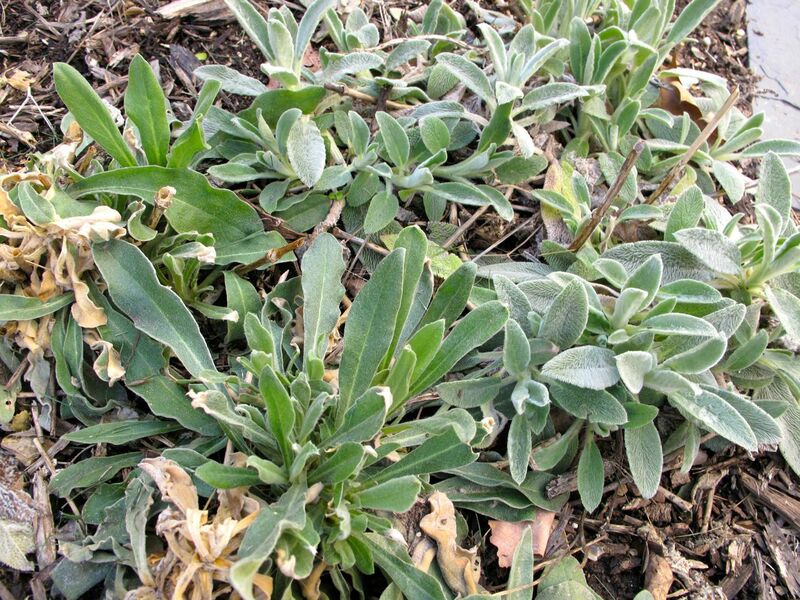 This entry was posted in garden and tagged Garden Bloggers Foliage Day, GBFD, Lychnis coronaria (Rose Campion) on March 22, 2014 by pbmgarden. Sorry I can’t help with a name for your wild plant Susie. Thank you for joining in this month; I think you should be able to divide your salvia fairly easily, just tease apart the new plantlets; I did the same with a Knautia yesterday to put into the new cuttings bed, If your gardenia has survived your winter I definately want to try one here; I was so impressed with the flowering period of yours last year and the perfume is wonderful. I have three kinds of gardenias. The ones growing up next to the house on the north side are the most protected and look barely bothered by the cold. The hedge of Chuck Hayes along the back fence look pretty tired but seem ok. I wouldn’t recommend these newer ones, August Beauty. But with some protection they should be ok. They do need a fair amount of water as you probably know. Aquilegia Canadensis are growing in the greenhouse at the moment from seed brought over by my nephew from Canada last year, as soon as they are big enough they will go into my sunset border as I think the colours will look just right there! I do hope your Gardenias sprout again, they are such a lovely plant with a fantastic perfume. I don’t think we have ever experienced a winter as cold as your last one, it must be pushing the boundries of hardiness to the extreme. Hope it warms up for you soon! Pauline, I read that you had a brief snow today. We may get one by Tuesday–if so, I hope it’s short-lived like yours. 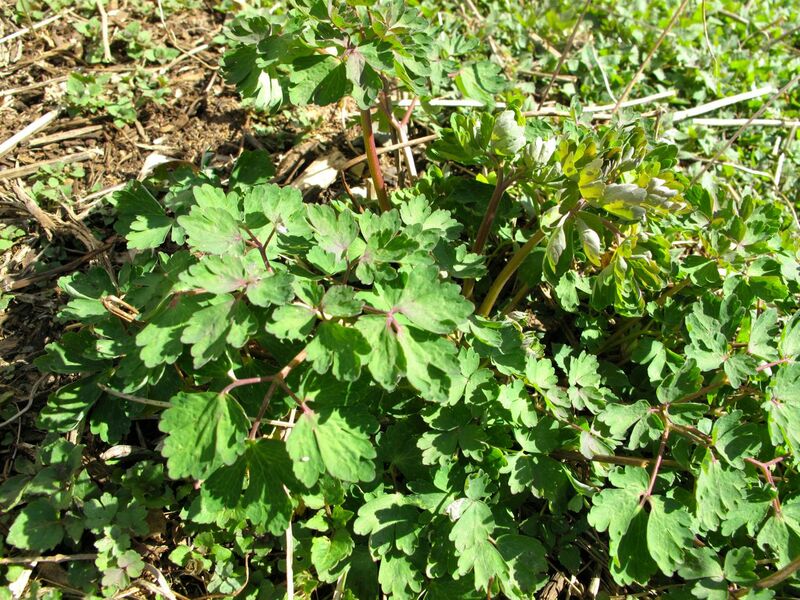 Can’t wait to see you Aquilegia Canadensis in bloom. Hope you’ve had a good day outdoors Susie. I have aquilegia vulgaris appearing all over my garden and the peonies and sage are about the same size as yours… you are usually a few weeks ahead of us, so I wonder how this year will progress! Hi Cathy. Got a bit of weeding done. 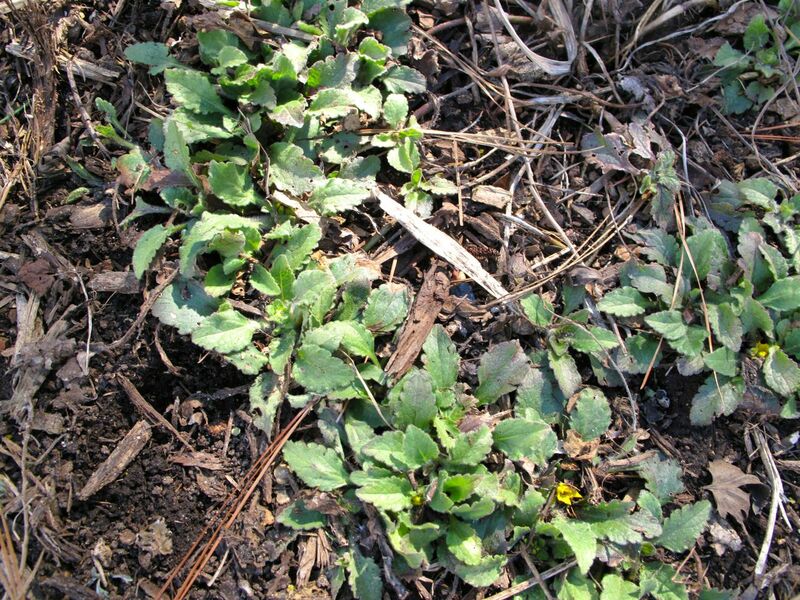 Weeds never seem to mind a cold winter. The variety of colors of aquilegia vulgaris make me want to try some too. Maybe this will be the year. It’s been interesting to see the bloom times vary so much this year. A couple of years ago when this area peaked weeks early in early spring, I noticed things caught up by June and fell back into a normal pace. Lovely to see so much foliage coming through after your long hard winter. Your little unknown wild flower looks just like a very battered Helleborus. Do you think it could be a young seedling? Yes Chloris, it crossed my mind it could be helleborus too. There are some planted nearby so very likely. Thanks! Despite your very hard winter many of the plants you have shown are well ahead of the same ones in my garden. 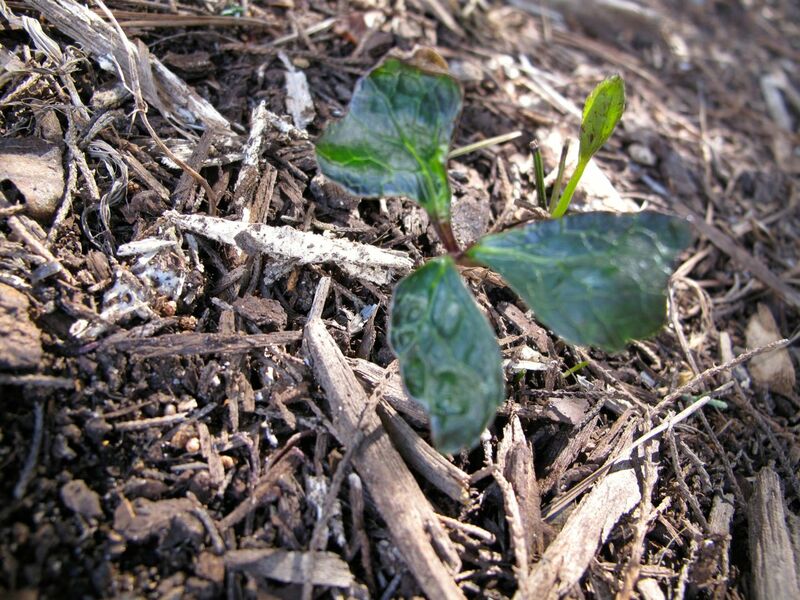 My peonies are only just breaking through soil level and there is no sign of my stachys. Having said that, with our mild winter my garden is well ahead of where it was this time last year. 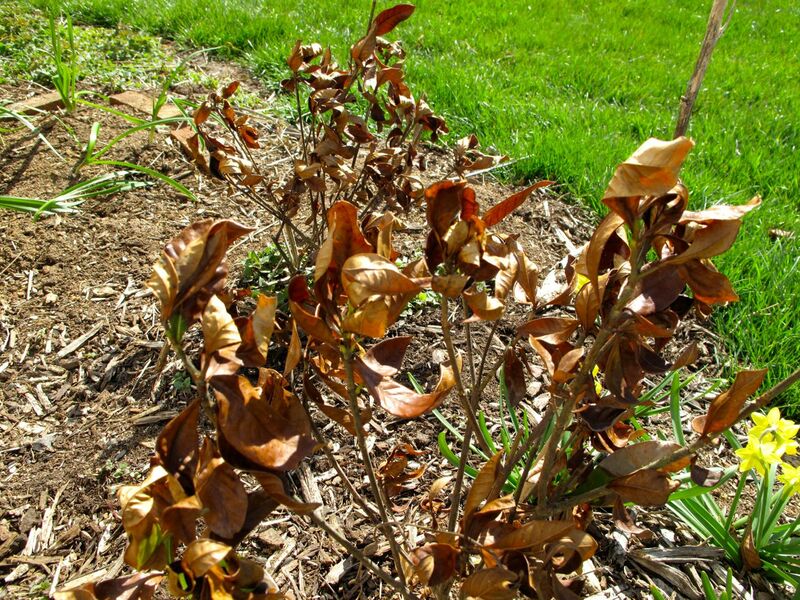 Looking at your photos of the gardenia and junipers you must be disheartened with the damage the winter has done. I hope that the weather is now improving for you so that you can get things sorted out! 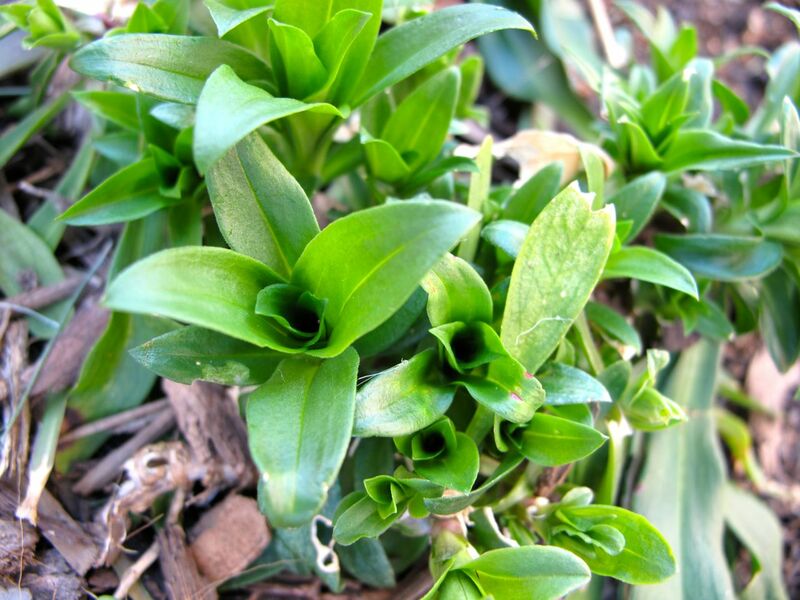 Hi Julie, it’s interesting to see which plants hold back a bit even when the weather promises it is spring. 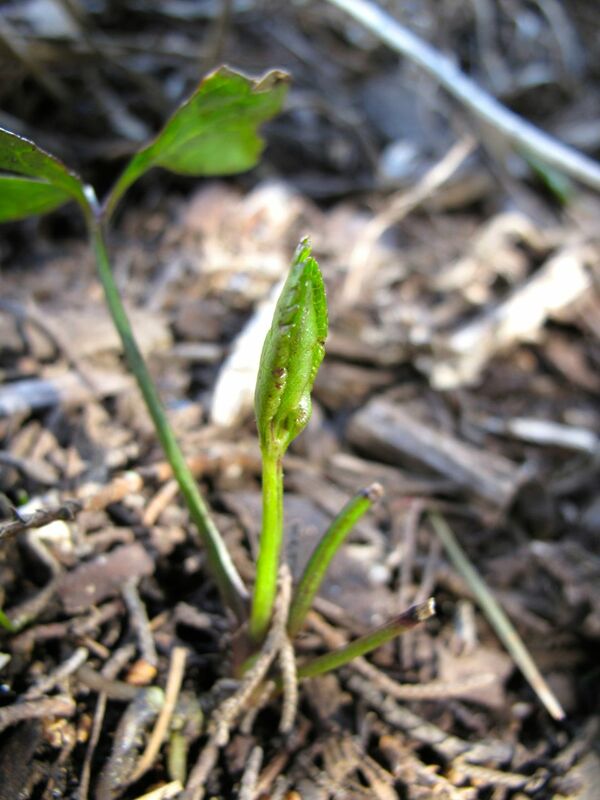 A couple of years ago we had a drastically early spring which set up the non-natives to open too early. The natives held back and were less affected when some more cold came through. It is a bit disheartening to see this year’s winter damage but I guess it will get sorted out. Too bad about the gardenias but they should sprout new leaves soon. Another shrub that has really taken it on the chin this winter is Indian hawthorn. Everyone I see is in the same shape. There is lots of promise in your garden though. The rose campion will be blooming before you know it. Yesterday, I noticed the buds on my dogwoods are just beginning to open. We’ve been noticing Indian hawthorns looking very downtrodden and thought the deer were ravaging them worse than usual, but ah ha! The weather has been hard on them. Good to know. Dogwoods are my favorite tree. 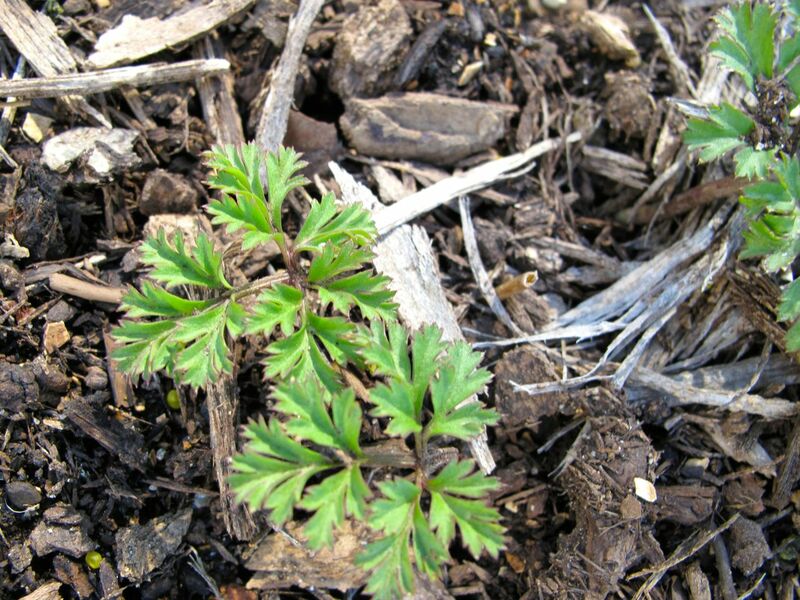 Nice to see your perennials emerging from the ground. I think wild columbine is my favorite spring foliage. Yes, columbine’s foliage is so fresh and charming really. It’s not as far along as usual but it seems to have picked up speed as of late. 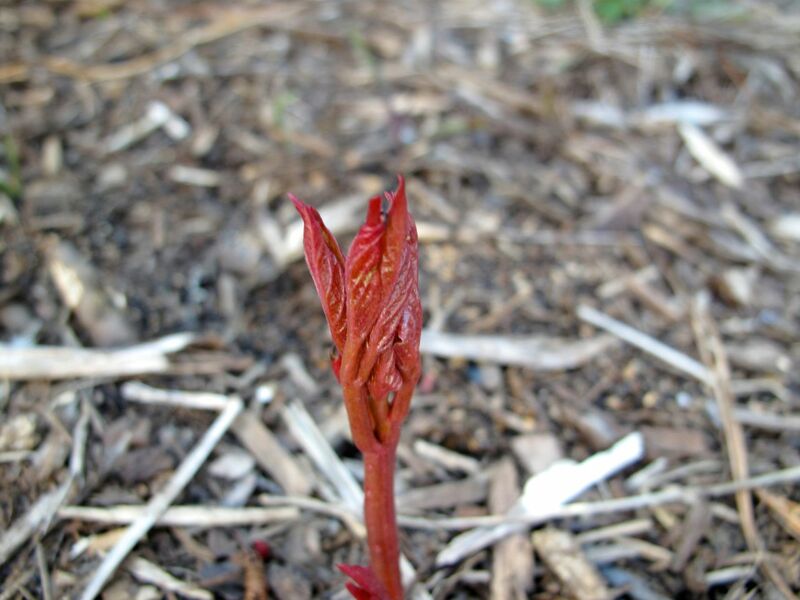 You can’t beat the first signs of new growth. I love new growth of peonies but don’t like them when they flower – strange eh! Well Malc that is a bit unusual to not like the flowers but the fresh young red growth is really something to admire. My peony was ruined by too much rain last year. I don’t like the idea of snow either, we have some predicted for Tuesday too. Fingers are crossed against it. Maybe the gardenias will pull through, but the junipers might be set up for repeated toppling every year. 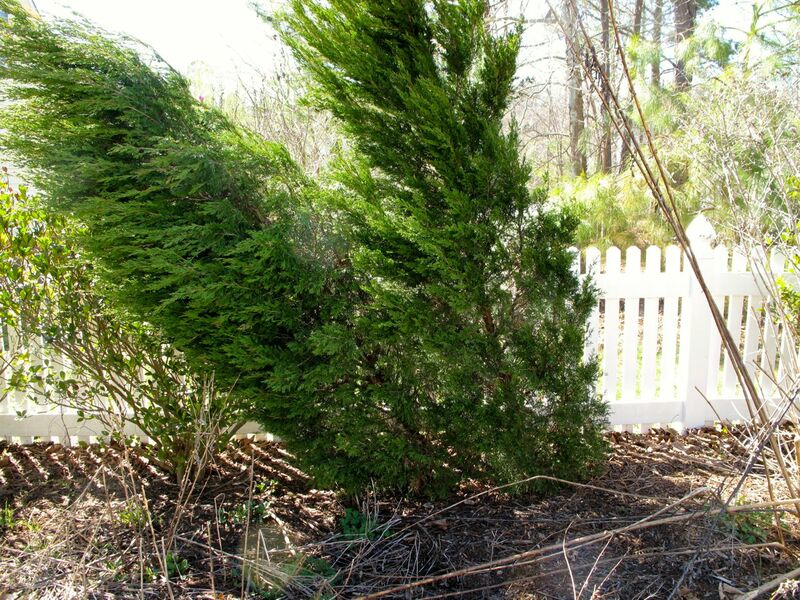 If you don’t mind the wilder look, maybe some red cedar will do alright in your shrub border? I’m going to pull those junipers out. Thanks for the suggestion of red cedar–I’ll research that. It is nice to have so many things showing they’re ready to get this spring show on the road. Hope the finger crossing works! It’s nice to see you already have a lot of colorful spring flowers and foliage. Sorry to hear about your gardenias, hope they pull through. Whatever poked its head above ground in our garden here almost immediately become deer food. They even grazed on the rhododendron this winter. We have a slight chance of snow today so spring flowers are being challenged again. Some of the gardenias are definitely fine. The newer variety has never really gotten established well. I’m thinking of trying to root some cuttings from the best ones. Sorry the deer are grazing so heavily–from what I’ve been reading the large deer population is an increasingly serious problem (without a good solution). Hope the rhododendron will recover.